High quality audio visual speaker faceplate with 2 x red and 2 x black gold plated connections. Solder tags on the rear and female sockets on the front of the speaker wall plate. A single gang speaker plate with 4 x gold plated connectors with solder tags on the rear of the faceplate with female sockets on the front. This is an excellent AV wall plate with 2 x red speaker connections and 2 x black that can wired directly into your sound or music system and connect to your audio device via the 4 x speaker faceplate. 4 x Gold Plated Female Sockets. 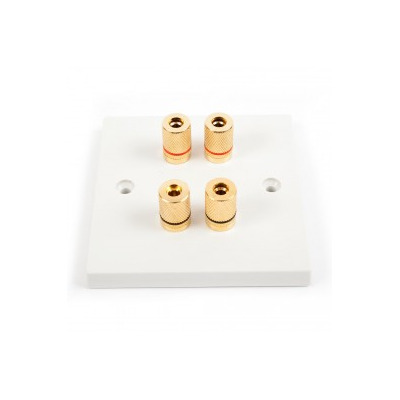 Euronetwork speaker wall plates are compatible with standard single gang electrical and double gang back boxes. It is ideal for a surround sound system install that enables you the speaker cables route the cable into the wall to hide those cables for a neat and tide install. Euronetwork manufacture and assemble various sound system speaker plates and euro modules from twin speaker faceplates, 4 x speaker outlets, 10 and 14 x speaker outlets with sub woofer connections, speak on connector wall plates and terminal speaker outlets.